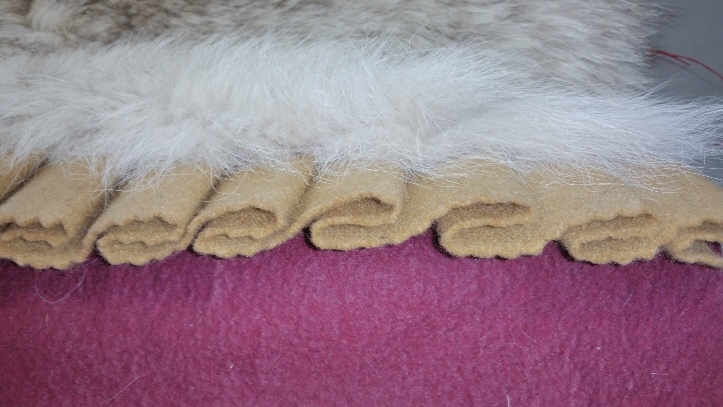 THIS IS A CLOSE UP PICTURE OF A COYOTE RUG DOUBLE FELT BORDER MOUNT. THE FOLLOWING TEXT EXPLAINS WHAT EACH PART OF THE BORDERS ARE CALLED SO WE BOTH UNDERSTAND (Taxidermist & Customer) WHAT YOU THE CUSTOMER ARE GETTING FOR YOUR MONEY. AND YOU CAN COMPARE TO OUR COMPETITORS QUALITY AND PRICES. 2. On the outer edge of the RUFFLES are whats called "PINKING." They look like small zig-zags. 3. So the 1st border has... RUFFLES & PINKING . 4. The inside edge of the RUFFLES felt cloth is sewn onto skin only about a 1/4" in. 6. The zig-zag edge again is called "PINKING." 7. So the 2nd border has SCALLOPS & PINKING. 8. The SCALLOP border goes all the way acrost the underside of the rug. 9. Not shown but still inserted is a thick 2"-3" flat cotton batting underneath the entire rug BETWEEN THE HIDE and the SCALLOPED 2nd border that goes all the way acrost the rug. This adds fullness to the rug; otherwise it would look too flat and it lifts rug to better match height of the feet. 10. Rugs can be placed on the floor as you often see them in peoples homes or on TV in front of the fireplace. IF they go on the floor we recommend you do NOT have anyone walk on them. In time this will ruin them. When these rugs are hung on the wall the weight of the rug tends to tear the felt with a nail or hanger. So we sew plastic rings in the CENTER OF EACH FOOT onto the gaberdine, felt and padding. Then nails in the wall can attach to the rings eliminating the weight from tearing through the cloth. Gaberdine is a tough cloth, as well as "Button and Carpet" thread is extremely tough. See picture again below; underside of rug showing.